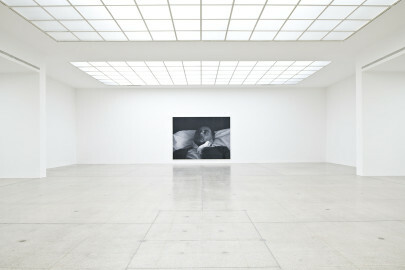 With his art, Rudolf Stingel has made a considerable contribution to breaking up the aura of the white cube. 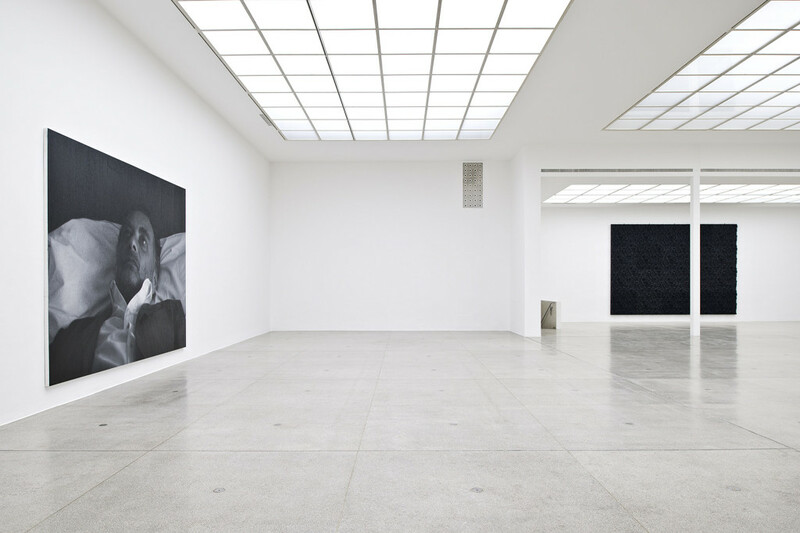 For many years, he has been questioning the definition of the panel painting and, going beyond its limits, he reverses the relationship between spaces and painting. 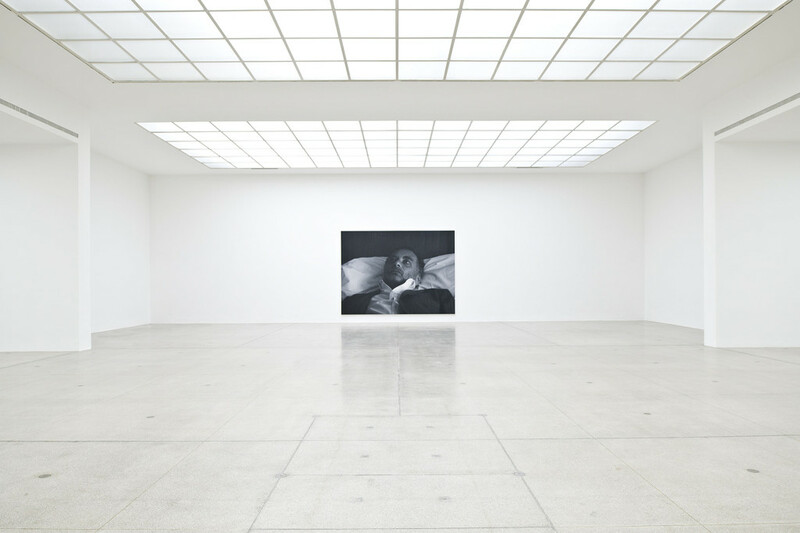 For example by laying carpets, as he did in 1993 at the Venice Biennial, in 1994 at Neue Galerie Graz, in 2004 in the hall of New York’s Grand Central Terminal, and in 2010 at Mies van der Rohe’s Neue Nationalgalerie in Berlin, whose modernist architectural idiom he wove into the carpet’s grey industrial quality while retaining the Agra pattern. 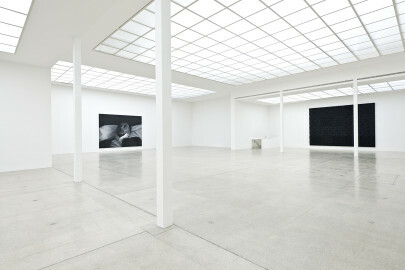 There is a sense both of a “domestication” (Reiner Zettl) of the exhibition space, and of a strong connection to its history and architecture. With his exhibition at the Secession, Stingel returns to the white cube and places three works in the auratic Hauptraum, a space he addresses playfully but with strict formalism. “The three pictorial objects are positioned to correspond with the Greek cross of the Secession building’s ground plan and to form a three-dimensional triptych.”, writes Reiner Zettl in his text in the exhibition catalogue. On entering the Hauptraum, there are immediate associations with a temple or mausoleum, as the Secession was once called by critics. Untitled (After Sam), his 2006 self-portrait based on a photograph by Sam Samore, acts as the central panel in an altarpiece, while the two reliefs positioned to the sides, Untitled (1631), suggest the doors of a tabernacle. 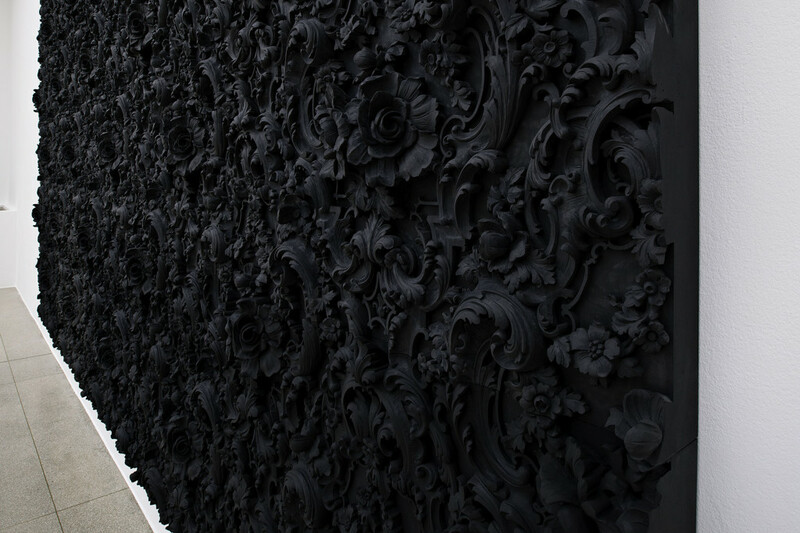 The two works in black plaster are inspired by Baroque damask wallpaper, its pattern referring both to the decorative elements of the building itself and to the quality of bourgeois living rooms and institutions. 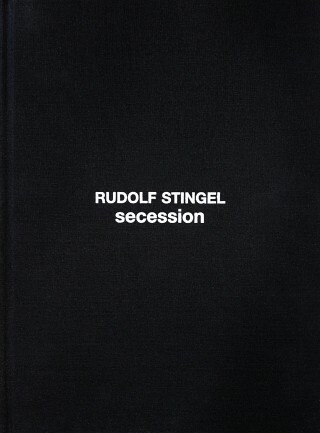 In contrast to previous large-scale installations, at the Secession Stingel has not chosen interactive familiarity. When he selects carpets and Celotex or styrofoam panels as his materials, as at the Venice Biennial or Frankfurt’s Home Depot, visitors are openly invited to leave their marks on the surfaces, thus creating a collective “contemporary cave painting” (Massimiliano Gioni). 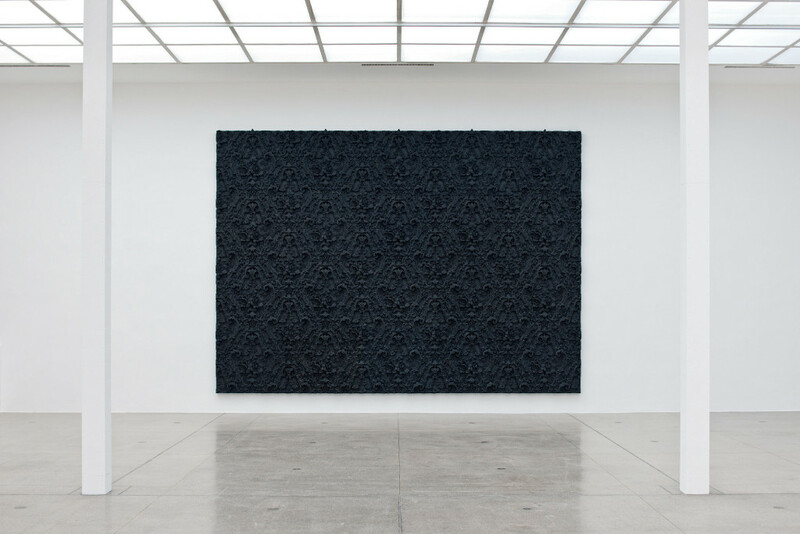 Although the finely wrought floral elements that protrude out into the Hauptraum amaze and attract the viewer, the work also inspires an awed distance, prompting visitors to seek out the center of the space in order to experience the symmetrical positioning of the works. From this position, the visitor’s gaze falls on the self-portrait, a photorealistic work that reveals itself on closer inspection to be a painting with a lively surface structure. 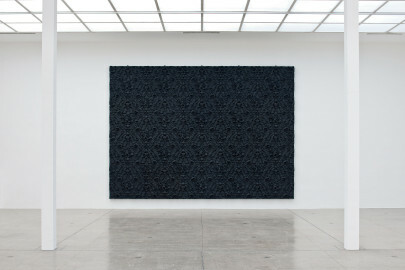 It was not until 2005, with his portrait of gallerist Paula Cooper painted from a photograph by Robert Mapplethorpe, that Stingel first moved away from pure abstraction. Since then, he has made a series of self-portraits, all of them both serious and mischievous at the same time. Many of them show a man with a sad look in his eyes, the artist as a lonely individual. 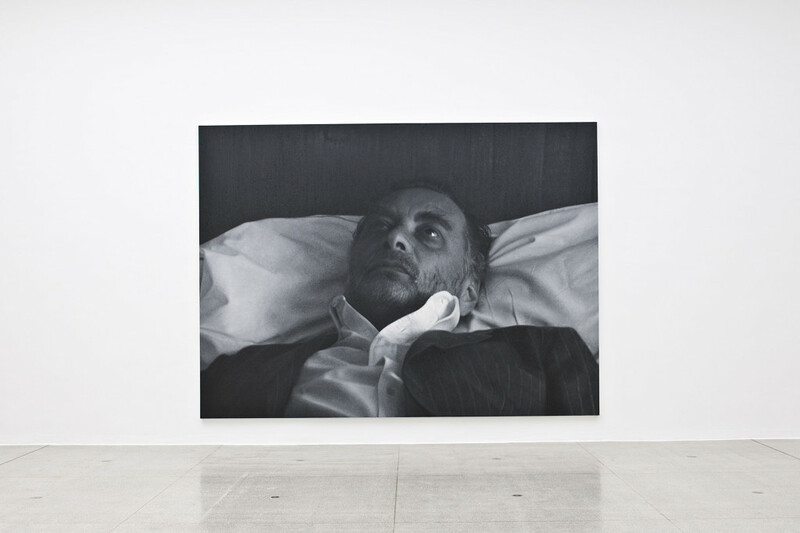 This playful element, as Stingel aims to break with the conventional image of the artist by portraying it, is a constant in his oeuvre, as is the unanswered question of what constitutes a work of art. This was already clear in 1989 when he published “Instructions / Instruzioni / Anleitung,” a step-by-step guide to creating his abstract paintings. 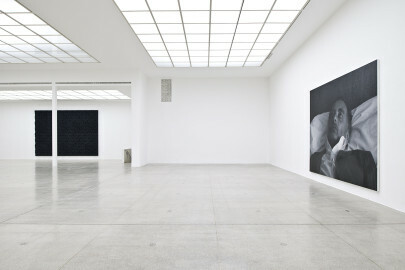 Rudolf Stingel, born in Merano (IT) in 1956, lives and works in New York City and Merano.